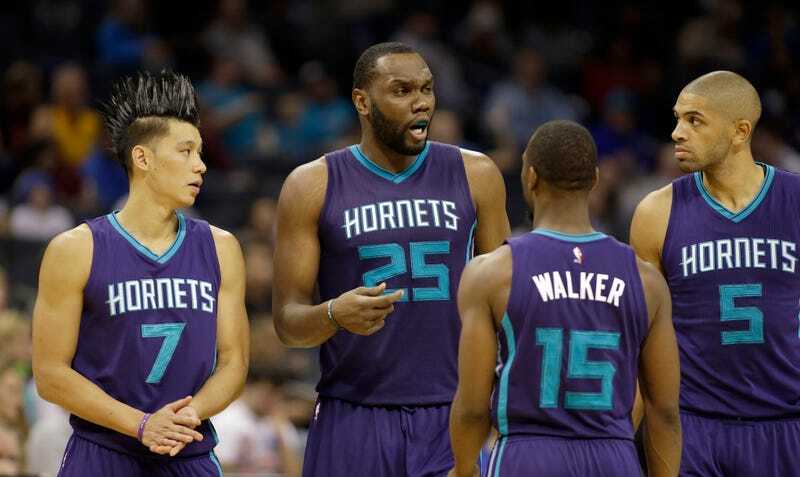 In their last four games, the Charlotte Hornets have blown out two of the Eastern Conference’s better teams, beaten the Bulls, and whooped on the Grizzlies. Charlotte’s only lost twice since Thanksgiving, to the Cavs and the Warriors (which is forgivable, since losing to them is like losing to gravity or the ocean.) All of a sudden, they’ve found themselves in second place in the East, all without Michael Kidd-Gilchrist, a foundational starter. So, uh, how did this happen? For one, Kidd-Gilchrist’s season-ending shoulder injury cleared the way for newly-acquired Nicolas Batum to play the largest offensive role of his career. Batum is in his prime, can shoot threes, and knows how to play within the flow of an offense as a deadly third option. Charlotte is shooting eight more threes a game, an improvement which Batum is a huge part of. In contrast, Kidd-Gilchrist is, uh, let’s say, an offensive liability. MKG might be a slightly better defender than Batum on the wing, but that’s negligible compared to the massive offensive boost Batum gives them. Hell, their defense is better this year anyway. P.J. Hairston also replaced Gerald Henderson in the starting lineup, and while he’s a worse player than Henderson, he uses less possessions and moves the ball better. He is also not Lance Stephenson, which really goes a long way. Hairston plays less minutes than backup shooting guard Jeremy Lamb, who is having a career year after sitting on the Thunder bench for a while. So he can’t shoot worth a damn, but Hairston, crucially, knows how to get out of the way. Their depth will be tested with Al Jefferson injured then serving a five-game suspension, but if there’s one thing the team has in spades it’s big men, flawed as they may be. Cody Zeller is filling in admirably for Jefferson. Spencer Hawes has always been a weird player, but he’s finding his footing again. Frank Kaminsky hasn’t quite figured out what he’s doing yet, but he’s shooting 40% from three while he works on it. Nobody is blowing the doors off any opponents, but as a unit, they help make the Hornets the third-best defensive rebounding team in the league. Having five quality big men plus a very capable stretch four in Marvin Williams means the Hornets have plenty of different looks they can throw at opponents. But for all their little improvements, 14-8 is a legitimately shocking record for this team. They don’t stand out in any statistical category besides turnovers, which aren’t necessarily the most rigorous indicator of offensive quality (the Warriors still turn it over a lot). That they’ve cobbled together one of the league’s best benches and turned a strange offensive series of parts into the NBA’s sixth-best offense is a testament to coach Steve Clifford’s skill. The Eastern Conference south of Cleveland is a mess, with eight teams making their cases for the second seed, but Charlotte looks like the type of team that could stick around if they can keep up their offense with Jefferson out. That’s a big if, but depth and defense make for stability, and while the Hornets may be short on superstars, they know who they are and they don’t make mistakes.